My wife and I are fortunate in that we've been handed down many items from family members that have a long history in our families, and I was wondering which one to try and shoot. In terms of sheer emotional attachment, though, it was hard to move past the ring I've photographed here. This is the ring my wife wears as her engagement ring, despite the fact that I did not, in fact, give it to her when I proposed (I knew she intended to wear this one, so I had a set of diamond-and-sapphire earrings made to match it instead.) 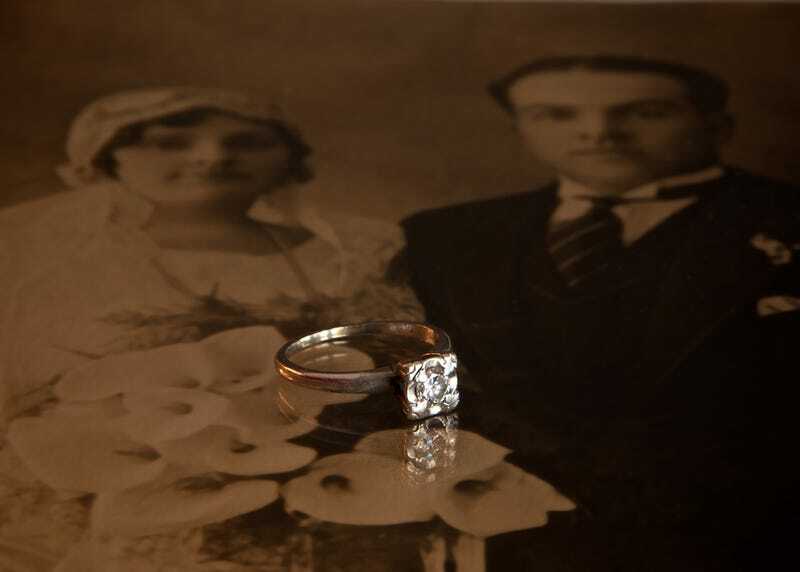 This ring was given to her by her great-aunt Vera, who recesived it as her engagement ring from her husband, Frank, at the beginning of their 50 years of marriage. Our dining room is adorned with the wedding pictures of our parents, grandparents, and, of course, Frank and Vera, so I decided to use their wedding photo as the backdrop, and the glass in the frame lent a nice reflection for the ring. We got this teapot as a gift for our wedding. The concept for this photo was to see the teapot in use. So pouring hot tea from the pot to a cup was an idea I had as soon as I read about this contest. Once I setup up the props and lighting for this shoot, the trial photos could not capture steam from the tea cup. I had to capture the steam illuminated only with a strong side light thus loosing details on the teapot and cup. Hence the final image is a composite of 2 photographs edited in Lightroom and Photoshop. Capture 1: Steam illuminated by an IKEA LED desk lamp. Capture 2: Nikon SB400 Speedlight bounced of the ceiling. For this challenge, I decided to use a 1922 silver dollar necklace my grandma gave me a while back. I originally tried holding it in front of the camera to take the photo, but when that didn't work I hung it from a tree branch instead. I think it's interesting that this is also the same coin that Harvey Dent has a double-sided version of in The Dark Knight. Pentax Optio WG-1, ISO 80, f/3.8, 1/60. This photo is of my dads Timex watch and collection of coins. Ask any coins dealer and they'll tell you these coins aren't worth much... Ask me, and i'll say these coins are priceless. on its way back to America so i used my Samsung ST67 point and shoot. With a vignetting filter. Dropped the brightness and boosted the contrast in photo shop. Enjoy! Long time reader, first time submitter (have never even posted a comment). My uncle made this figurine in the likeness of his father, my grandfather, when he was young. My grandfather was an award winning photographer; had a dark room in the basement and everything. My grandfather died when i was a child (I am 30) and whenever I was at my Grandma's house and looked at this figurine I instantly thought "Grandpa!!". Yes, he had bushy eyebrows and a constant scowl on his face. My grandma died 2 years ago, and my aunt was going to throw this figurine away. Luckily my mom showed up and was able to save it. This past Xmas my my mom gave me the figurine and it almost brought me to tears. I don't have a very large family and I don't have any heirlooms from my side of the family. But, before I married my wife, my in-laws gave me a piece of their family history to take into my new family with their daughter. My mother-in-law gave me her mothers ring and my father-in-law gave me an old WWI Waffenfabrik Steyr, 8mm pistol that was brought back from the war by his grandfather. Both of these heirlooms are from a different era. One of exceeding decadence and one of pride in military service and duty to country and fellow man. These have both been stored in a safe since I married my wife and this competition reminded me of them. In the picture my wife is wearing the ring and holding the gun. 1999 My Grandfather died, I was there, I'll never forget the day. I won't tell the story, but this watch tells me all about his life more than I ever heard from him. It was given to me by my father and grandmother after he died.. I wore it all the time until it quit out on me. His old wind-up Timex never left his wrist and that's apparent with all the damage it has seemed to take. It seemed like the perfect fit for this challenge, I have such a hard time remembering to do the challenges so I HAD to follow through. I took this photo with my tripod mounted Canon 60D with my 50mm f1.8 at 100 ISO f22 at a 10 sec exposure with a macro filter and using my old Rebel XS as a flash, orienting it on each side of the watch with a piece of matte board to block the light from hitting the background. I layered 2 pictures on top of each other to lighten up the darker side, as I attempt to teach myself how to light paint. Chromatic Aberration was an issue until I applied a infrared filter in Photoshop, which also brought out all the detail in the scratches. I took pictures of this watch for 4 days straight. Still not completely happy, but I never am. My Grandpa who passed away just a few years ago, gave to me some of the foreign money he had picked up through his voyages in WW2. He was on various ships and traveled quite extensively. I wanted to illustrate this through having the money on a suitcase. Made some curves adjustments in photoshop. My husband and I own a fused glass studio. He said this bowl was in his home as long as he can remember. He always liked it - maybe it planted the seeds to his eventual path to glass art. This isn't quite technically an heirloom yet but I think it will be. It belongs to my fiance whose nickname is Dee. She got it over 15 years ago. She is the youngest of 8 children. Their genders from oldest to youngest are girl, boy, boy, girl, boy, boy, boy, girl. The reason I mention this is because her first 8 nieces and nephews were born in that same order. Because of this, the eighth child was named after my fiance and this chain and charm will eventually be passed down to her. I decided to set this "heirloom" over an old looking sweater as I thought it would help aging the subject. I also specifically picked the sweater because of the color. I took a couple shots and knew this was the way I wanted to go as the colors of the chain/charm and sweater are basically complementary. This is a necklace that my mother gave me when I was born. She told me that the whole thing is handmade. I don't really wear it or appreciate it that often mainly because it is indeed a very delicate and valuable piece of jewelry. Originally, I wanted to juxtapose the delicateness of my necklace against something harsh and rugged like a wrought iron fence. But it's been cold and rainy so I decided to stay indoors and interlace my necklace on my wrought iron staircase instead. I walk down this staircase everyday and I always see my living room and all the pretty Christmas lights on the window. I've been playing a lot with Bokeh too so I thought why not combine the two?! For my Bokeh I chose to cut out the Chinese character for "heart" which is 心. I know everyone likes the heart shape Bokeh but I wanted to try something different and creative. Also because this heirloom came from the heart and I wanted to give the image a very Chinese feel but not in a cheesy way. So in the end we have something that is geometric, not overly sentimental, a background that brings out the purple in the jade pendant and colorful Bokeh shapes. Canon 7D, EF 100mm L, 2.5 sec @ f/20, ambient lighting. The donkey is a bottle opener (still works great!) that was prominently displayed in the basement when I was a kid. We moved and the donkey slid from my memory until it came back into my life a couple years ago. That's a sheet of paper taped to a shelf in my living room. A lamp was about 10ft behind and to the right of the camera, shade off, a white board on the left of the donkey for light bounce. It is proper up on a dime to give separation. This Aztec figurine wasn't necessarily passed down to me I just found it in the stuff my grandmother left behind so now it's mine. She had quite a collection of these small figurines, but this one, with its angry scowl, is my favorite. It's about 9 inches tall. The headdress is a bird with the face coming out of the open beak. It's not really an heirloom now, but maybe if I pass it down it could become one. Canon 60D, Sigma 70-300 4-5.6mm APO @ 300, ISO 200, f/5.6, 1/800. I don't have many heirlooms, at least ones that would make a good photo. After trying a shot of my grandfather's pocketknife and one of my grandmother's blue glass pitcher, I settled on my wife's grandmother's onyx bead necklace. I really liked how the beads lit up when light was shined on them. I played around with my office lamp trying to get the best lighting and was pleased with the shadows and reflection in the table top. Hope you like it. These earrings belonged to my grandmother and they were given to her as a gift by her aunt in 1932. They are the most precious and oldest possession that I hold very close to my heart. I placed them on a boulder and ran some water down the rock as I took the shot. I darkened the colours just a little in iPhoto. I had been carrying my great-grandmother's bracelet around in my pocket since this challenge was issued, trying to think of what to do with it. The bracelet has always reminded me of the poem "Les Bijoux" (The Jewels) by Baudelaire and I hoped to draw inspiration from it. In this image I have attempted to capture the line "I love all things in which sound is mingled with light," in memory of my grandmother who loved poetry. My name is Greg Wesolowich. My photo was taken with a canon 40D with a 50mm 1.4 lens. I just used the cheap light I have in my room. The photo was taken at f/1.4 and I took about 7 exposures to try playing around with HDRing. Anyway, these were cufflinks that belonged to my grandfather. He pasted away well before I was born but my mom has told me many of stories about him as I grew up. He was a machinist while he was in the navy. All I ever had of my grandfather was the stories I was told. One day my mom gave me these cufflinks and I was really excited. I am always excited to wear/show off these cufflinks. I hope you enjoy my photo, take care! One of my family heirlooms is this Victrola. My parents have had it since I was a little kid and I can always remember my dad playing the old records so I could watch the man dance to the music. The record player itself has to be wound up and it has doors on the front to control how loud the record plays. When the records are played they are inaudible due to their age but to this day I still enjoy listening to it every once in awhile. When my dad passed away a few years ago my mom was going to sell it because she didn't have room for it in her new house so I took it. I plan on playing it for my children one day and I hope they will enjoy it as much as I did when I was a little kid so I can pass it on to them. I took this photo using my iPhone 4 with my Olloclip (wide angle/macro) lens attached. I edited it in photoshop express for brightness and saturation and then camera+ for clarity and color enhancement. This dollar bill belonged to my late grandfather. In late 70's, someone at work had given him this bill as a fun gift after their visit to United States (The bill reads 'Series 1974'). All the generations in my family have lived in India and had not traveled to US. Grandpa was saving this bill to forward it to someone on the right occasion. He gifted the bill as a symbol of success on my uncle's (his son's) college graduation. My uncle held on to this memento for 23 years. Four years ago, when I received an admission letter to study for Masters in United States, my uncle gave me this bill as a symbol of success and good luck! I have carried this bill in my pocket ever since, and I wish to forward it to someone in my family in the future! Some of my fondest memories from my childhood are the ones of spending the weekends on my grandparents' farm. My cousins and I would spend the day playing in the barn, climbing chicken coops and seeing who could get higher on the silo ladder. Above all those memories are the ones when my grandpa would play his harmonica for us. We would sit around the fire and he would be in his old rickety rocking chair, in his trademark flannel shirt and overhauls that smelled of hay and diesel fuel, to play ‘the good ol' hymns'. As Grandpa got older it became harder for him to play the harmonica, and us kids out grew the awe-effect of it. But he still carried it in his pocket every day.